American Anthems takes audiences on a journey from the East to the West Coast of the USA, searching for a huge Rock star that disappeared at the peak of his career in the early 90’s, to bring him back for one last concert. 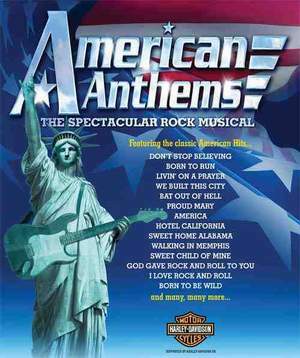 The Show has a hugely talented cast of singers, dancers, fully live band and features some of the greatest American Anthems including Born To Run, Livin’ On A Prayer, We Built This City, Bat Out of Hell, Proud Mary, Born to be Wild, St Elmo’s Fire, Walking in Memphis, Sweet Child of Mine, and many more. John Parr, who had Worldwide hits with “St Elmo’s Fire” and “ Naughty Naughty” will be appearing as a guest star on ALL the UK dates.